FieldLink Configurator is CDI's proprietary device communications and configuration program. It	provides for wireless configuration of CDI's TRAXALL "X	Series"	transmitters, as well as CDI's upcoming acoustic pinger system SeaTrack. 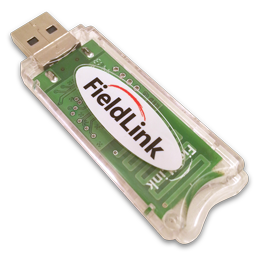 FieldLink Configurator communicates to CDI's FieldLink compatible devices through the use of a proprietary radio frequency USB dongle. Simply plug it in and go! FieldLink Configurator provides wireless configuration of CDI's newest and most sophisticated electromagnetic transmitters. 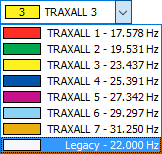 Through the use a of a simple drop-down menu, an operator may select one of TRAXALL's seven primary frequencies or the industry-standard 22Hz legacy frequency. CDI's new X-Seriestransmitters provide true output power variability, putting the tradeoff of battery life versus transmission power directly into the hands of end users. To control power, simply use FieldLink Configurator's power slider and adjust output power anywhere between minimum and maximum. 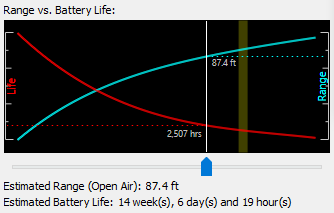 The transmitter's estimated battery life is dynamically updated as the slider is moved. This powerful capability allows pipeline pigging professionals to tailor a transmitter for maximum range and optimum battery life on a per-run basis. Pulse or continuous transmission modes may be selected at will by the operator by simply clicking on their radio buttons. Estimated battery life will change to reflect the new power requirements. If pulsing mode is chosen, the operator may define his own pulse pattern and upload it to the transmitter. 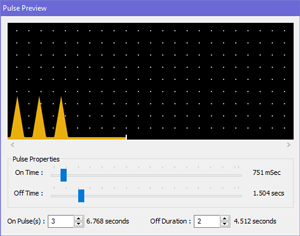 On and off times may be be specified in milliseconds as shown to the right. On pulse repeats and off pulse repeats, along with the durations of each may be specified, allowing for an unprecedented electromagnetic transmission signature definition. If legacy 22Hz equipment is being used for pig tracking, and pulse patterns are being used to differentiate one pig from another, FieldLink provides almost infinite pattern possibilities. 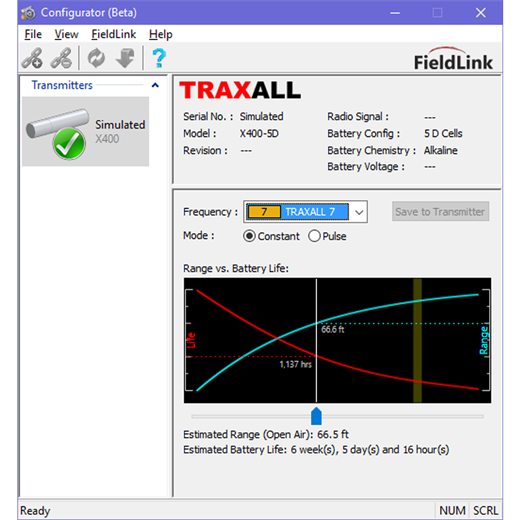 Configuration program for TRAXALL Series electromagnetic transmitters.